In my mind, this soundtrack always gets filed next to 'Teesri Manzil'. Maybe it's because I acquired both at around the same time; maybe it's because they're of the same (approximate) vintage and style. Or maybe it's because both are by RD Burman. Yes, Sachin Dev is the credited music director, but Pancham is all over this. And I'm not complaining; 'Jewel Thief' [review]   is a charmer from start to finish. My favourite tracks are Asha Bhosle's classy cabaret number (and wonderful Helen showcase) 'Baithen Hain Kya Uske Pas', and the super groovy, John Barry-meets-Lalo Schifrin-in-Bombay type 'Dance Music'. That shouldn't surprise anyone. Another highlight is the trippy, tribal sounding 'Othon Men Aisi Baat', from the opening screech of a trumpet to its evocative melody. And in between there's the feelgood pop of 'Yeh Dil Na Hota Bechara', 'Aasman Ke Neeche' and the gorgeous 'Raat Akeli Hai'. Such a mid-60s classic! Bless ye! And you're right... it is very much of the Teesri Manzil/Love in Tokyo generation. Jwelthief is purely Sachin Dev Burman, Yes ofcourse we can sense RD because he was SD's assitant. You think? I have it from a fairly reliable source that RD composed large chunks of this, in addition to assisting his old man. Both are pictured (equally sized) on the back cover - how many mere assistants got that? For the answer, watch Pancham Unmixed. Gulzar clearly mentions regarding the early times when R D was assisting his Dad, he composed entire songs since it was the late 1960s when S D's used to be ill quite frequently. That's when Burman Jr. joined the league. Also, Asha Bhosle has particualrly mentioned "Baithe Hain Kya Uske Paas" in the coffee table book that comes with Pancham Unmixed that he overlapped her voice on 4 to 6 tracks and executed that manually by making her stop and sing at different times during the recording. Asha was his wife and she testifies of all this herself? Anyone got stuff to deny that R D was not the one after this composition?? Come talk to me. Thanks for the link PC. 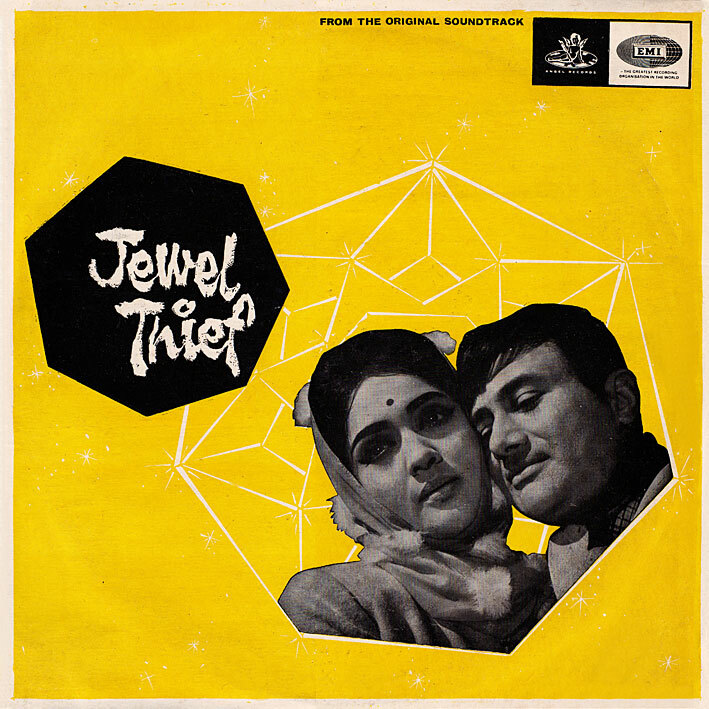 Jewel Thief the OST and movie is one of my all time favourites. RD did not start composing full-fledged songs for RD in the mid-sixties, him and Meera Dev Burman were the brainchild behind "choice" SD compositions from earlier than that. Thanks PC for the vinyl rip !!!. I don't care who wrote it, I'm just glad I can listen to it! :) Thanks PC! Thanks for the album PC...excellent songs...i love the dance music. Harshi I'm dont go totally with your views, Asha Bhonsle is not true to everysense. as if she is not good with talk when it comes to Burmans, if the issue is only Burman then Preference is RD over SD, not becuase RD was her husband but, because RD is more sellable in the market. Hothon pe means "on the lips"! No, I don't listen to the lyrics much, seeing as I'm not Indian and don't undestand Hindi. I do however look at the covers of the Indian LPs I post, and 'Othon Men Aisi Baat' is exactly how it is written there.